This is the first critically endangered species to be included on the #BeakoftheWeek blog. The tooth-billed pigeon is endemic to the Samoan islands of Upolu and Savai’i (where is it known as Manumea) and is one of the closest relatives to the legendary extinct dodo. This fascinating pigeon is nicknamed the ‘little dodo’ and unfortunately relatively little is known about it. The tooth-billed pigeon is an EDGE (Evolutionarily Distinct & Globally Endangered) species and it is believed that there is only between 50-249 mature individuals left in the wild. Drivers of declines in numbers are habitat destruction (logging and cattle ranches), hunting, invasive species and damage by cyclones during the 1990s. It is the national bird of Samoa and is legally protected from hunting although this is not enforced. Conservation efforts are targeted at bringing this species back from the brink of extinction, such as habitat restoration and extending hunting bans to including all native pigeons to prevent accidental killing. Establishment of captive populations and translocation to rat-free islands are also being considered as possible steps. The Dodo, unfortunately extinct but manages to be one of the most well known birds ever to have existed. Little is known about breeding in this species except that they are thought to nest in thick foliage about 5-12m from the ground and lay 2 eggs per clutch. I can offer you up some good news today! Back in 2013 a juvenile tooth-billed pigeon was photographed on Savai’i which means that they are still breeding even though they are not being spotted very often. Hopefully conservation efforts will lead to an increase in this species’ numbers in the near future so that we don’t lose them forever. No Xeno Canto links calls are available for this species unfortunately, so you will have to sit back and enjoy this cool OneZoom animation and explore their nearest relatives. Definitely recommend taking a peak at the Nicobar pigeon, I do love that pigeon. Baptista, L.F., Trail, P.W., Horblit, H.M., Kirwan, G.M. & Sharpe, C.J. (2014). Tooth-billed Pigeon (Didunculus strigirostris). In: del Hoyo, J., Elliott, A., Sargatal, J., Christie, D.A. & de Juana, E. (eds.) (2014). Handbook of the Birds of the World Alive. Lynx Edicions, Barcelona. (retrieved from http://www.hbw.com/node/54282 on 20 July 2015). BirdLife International (2015) Species factsheet: Didunculus strigirostris. Downloaded from http://www.birdlife.org on 20/07/2015. “Tooth-billed pigeon mount” by Gunnar Creutz is licensed under CC BY-SA 4.0. “The dodo” by Biodiversity Heritage Library is licensed under CC BY-NC-SA 2.0. The Marabou stork is the bird of choice today, a member of the Ciconiidae family. An absolute beast of a bird, this former #BeakoftheWeek candidate can grow as tall as Kylie Minogue (range 115-152cm) and has one of the biggest wingspans of all birds (2.25-2.87cm). It is not just its appearance that makes it an intimidating creature as its feeding strategies have led to it being christened as the “Undertaker Bird”. It feeds on carrion and can been seen mixing amongst vultures at large predator carcasses. One interesting technique that they employ to catch their prey, which could definitely be classed as rather cruel, is to wait near grass fires and grab animals as they emerge. A case of out of the fire and straight to the undertaker. This species has a wide range across central and southern Africa inhabiting grassland, open dry savannah, river banks, near fishing villages and also around rubbish dumps and slaughterhouses. They are opportunistic feeders, and the unsuitability of their beaks to dismembering carcasses leads to them taking scraps from vultures and other predators or eatting things that are dropped. Their diet is varied with them feeding on birds, invertebrates, rats and lizards. They are also adept fishermen, fishing by sight and by submerging their partially open beak and snatching them up. The number of birds in a colony can be in the thousands, but usually 20-60 pairs, with breeding season varying between the tropics and equatorial zones. In the tropics it begins in the dry season and ends in the rainy season, whereas it is more variable around the equator. They usually make their nests in trees 10-30m off the ground out of twigs and green leaves. Typically they lay 2-3 eggs that take ~30 days to hatch and then a further 95-115 days to fledge. Global population was estimated at between 200,000-500,000 in 2006 and it is thought that these numbers are increasing as it utilises its ability to exploit rubbish dumped by humans. This species is of least concern on the IUCN redlist. It is thought that its perceivably unattractive appearance could be making it less appealing to hunters and knowledge that they play an important role in clearing up rubbish and carcasses, helping to prevent disease, may stop people from targeting them. Xeno canto once again has a few calls for you to listen to and OneZoom is a fantastic little site that lets you explore where this species sits in the tree of life. BirdLife International (2015) Species factsheet: Leptoptilos crumenifer. Downloaded from http://www.birdlife.org on 10/07/2015. Elliott, A., Garcia, E.F.J. & Boesman, P. (2014). Marabou (Leptoptilos crumenifer). In: del Hoyo, J., Elliott, A., Sargatal, J., Christie, D.A. & de Juana, E. (eds.) (2014). Handbook of the Birds of the World Alive. Lynx Edicions, Barcelona. (retrieved fromhttp://www.hbw.com/node/52751 on 10 July 2015). “Marabou stork” by Dr. Lloyd Glenn Ingles is licensed under CC BY-NC-SA 3.0. “Marabou scavenging” by Brocken Inaglor is licensed under CC BY-SA 3.0. 5cense. 2007. Marabou Storks Eating, Grooming, Mating & Generaly Brooding. [Online]. [10/07/2015]. Available from: https://www.youtube.com/watch?v=wuwbPyTtG1k. 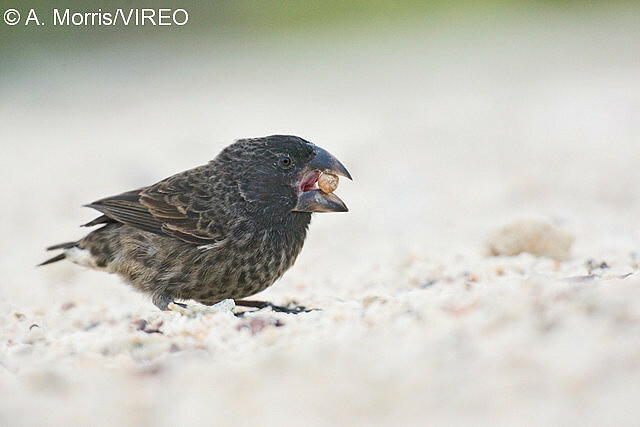 Today we’re talking about a challenging past #BeakoftheWeek nominee, the large ground finch. As the name suggests this species has a rather large bill relative to its body size and is often as deep as it is long. You can see why it has been charmingly nicknamed ‘Megamouth’. Amongst the most famous groups of birds in the world, this species has the honour of being one of Darwin’s finches. Here is a nice brief recap on Darwin’s finches, and a great little graphic showing their different bill shapes and diet. This clip talks about them further whilst showing some of the different species. Endemic to the Galapagos Islands off of the West coast of Ecuador, they are found in arid scrub and lowland areas on many of the islands. . These birds use their big beaks to feed on caterpillars, fruits and large seeds. Males are almost entirely black with slightly browner wings and tail, and females are dark brown with sandy-buff fringing. They are about 15cm long and weigh around 35g. This species is usually monogamous and tend to mate after the first rains of the season. Nest building is carried out by the male who constructs a sphere made from dry grass and other vegetation with a lateral entrance near the top. The pair can lay up to 4 clutches in one season, which usually consists of 4 eggs that take about 12 days to hatch. The nestlings leave the nest after around 14 days. This species is of least concern on the IUCN redlist, and population numbers are said to be stable. Xeno Canto has a solitary song for them, and you can reacquaint yourself with exactly where the Galapagos Islands are by following the link. BirdLife International 2012. Geospiza magnirostris. The IUCN Red List of Threatened Species. Version 2015.2. <www.iucnredlist.org>. Downloaded on 06 July 2015. Jaramillo, A. & Christie, D.A. (2013). Large Ground-finch (Geospiza magnirostris). In: del Hoyo, J., Elliott, A., Sargatal, J., Christie, D.A. & de Juana, E. (eds.) (2013). Handbook of the Birds of the World Alive. Lynx Edicions, Barcelona. (retrieved from http://www.hbw.com/node/62175 on 6 July 2015). “Large ground finch male” by Gerald and Buff Corsi is licensed under CC BY-NC-SA 3.0. “Large ground finch pair” by John Gould is licensed under Public Domain Mark 1.0. Time for some more information on a past #BeakoftheWeek star, the double-toothed kite. They are named for after the presence of two tomial “teeth” on the edge of their upper mandible. Their wingspan reaches around 65cm and they are 29-35cm tall. Females are slightly bigger than males at 190-229g (males 161-198g). Double-toothed kite. You can just about make out the teeth in this photo. When hunting this species uses a clever trick of following monkeys through the canopy waiting for them to disturb insects and lizards, which they will then catch and eat. A nice way of getting someone else to work for your dinner. It is seemingly a parasitic relationship as there is no apparent benefit to the monkeys, although the presence of this kite may help protect them against larger birds of prey. They have a preference for monkeys that tend to move extensively whilst foraging instead of sitting idly for long period, which makes sense if they are hoping they will flush out tasty treats. They are also known to eat snakes, birds and rodents amongst others. Unfortunately I cannot find a video of this interesting behaviour. Here is a nice, if old, paper on the association between this species and white-faced capuchin monkeys. This species has a large range, stretching from southern Mexico through much of northern south America. Its breeding season varies across the range but tends to be between April and July. The female is thought to incubate and brood the chicks alone although the male provides much of the food during incubation and early nestling period. The female carries out the lions share of nest construction, building a nest out of twigs in the fork of a tree between 7 and 33m from the ground. Females typically lay 2 eggs which take 42-45 days to hatch and then the chicks usually leave the nest after 27-31 days. Within two months the young are independent of their parents. You can once again head straight over to Xeno Canto to complete your experience with some bird of prey calls. BirdLife International (2015) Species factsheet: Harpagus bidentatus. Downloaded from http://www.birdlife.org on 09/07/2015. Bierregaard, R.O., Jr, Marks, J.S. & Kirwan, G.M. (2015). Double-toothed Kite (Harpagus bidentatus). In: del Hoyo, J., Elliott, A., Sargatal, J., Christie, D.A. & de Juana, E. (eds.) (2015). Handbook of the Birds of the World Alive. Lynx Edicions, Barcelona. (retrieved fromhttp://www.hbw.com/node/52973 on 9 July 2015). “Double toothed kite” by joule_e is licensed under CC BY-NC-SA 2.0. One of our original #BeakoftheWeek stars, the pink-eared duck is the focus of todays blog. The pink-eared duck is endemic to Australia and is the only member of the genus Malacorhynchus (meaning ‘soft-beak’) alive today. An extinct species of the genus, the Scarlett’s duck (Malacorhynchys scarletti), has been described from New Zealand (Olson, 1977). It is a rather attractive duck, with striking dark brown and white feathers along its chest and flanks, giving it its alternative name the zebra duck. It has buff-brown feathers underneath its tail, brown wings and back, a white rump, white neck feathers, a white face with grey along the forehead and crown and a dark brown patch surrounding a narrow ring of white feathers around the eye. As its name suggests, the pink-eared duck also has a small pink patch of feathers behind the eye. This patch of feathers is unusual as it contains carotenoid pigments which are absent from the rest of the order Anseriformes (Thomas et al. 2014). Males and females are almost indistinguishable, with females being slightly smaller than males. Juveniles are duller and browner than the adults. The large, grey bill of the pink-eared duck has a square tip, soft membranous flaps and spatula-like shape. The highly specialised bill also contains rows of fine, comb-like structures called lamellae. These features make the bill perfectly adapted for sweeping through, and filtering, water and mud for the small crustaceans, insects, algae and seeds on which the bird feeds. Individuals may feed alone, in pairs or in groups (See a video of pink-eared ducks feeding here). When foraging, pink-eared ducks are mostly surface filterers, but have been recorded dabbling, up-ending and vortexing. Vortexing disturbs aquatic organisms as the birds rotate, meaning both individuals benefit from this behaviour. Pink-eared ducks have a variety of calls, including trilling, twittering, chirruping and a low ‘grunk’ sound. Breeding pairs are thought to be monogamous and these ducks probably have a long-lasting pair bond. Nests are built in tree hollows, nest boxes or the old-nests of other water birds. The female lays a clutch of 3-11 creamy white eggs and incubates them for around 26 days. The ducklings are covered in brown and white down, with a distinctive brown eyestripe. Their bills already have the membranous flaps of the adult birds. Both adults tend the offspring, and fledging occurs when the ducklings are 45-60 days old. The pink-eared duck is highly mobile and can be found in temporary, saline or brackish waters, or more permanent waterbodies across inland Australia. Because of its nomadic nature, population size is hard to estimate, but is thought to fall between a few hundred thousand to over one million individuals. The IUCN list the pink-eared duck as least concern. Hunters may shoot a large number of these birds, but only across parts of its range. BirdLife International (2012). Malacorhynchus membranaceus. The IUCN Red List of Threatened Species. Version 2015.2. <www.iucnredlist.org>. Downloaded on 02 July 2015. BirdLife International (2015). Species factsheet:Malacorhynchus membranaceus. Downloaded fromhttp://www.birdlife.org on 02/07/2015. Carboneras, C. & Kirwan, G.M. (2014). Pink-eared Duck (Malacorhynchus membranaceus). In: del Hoyo, J., Elliott, A., Sargatal, J., Christie, D.A. & de Juana, E. (eds.) (2014). Handbook of the Birds of the World Alive. Lynx Edicions, Barcelona. (retrieved from http://www.hbw.com/node/52897 on 2 July 2015). Olson, S.L. (1977). Notes on subfossil Anatidae from New Zealand, including a new species of Pink-eared Duck Malacorhynchus. Emu, 77: 132-135. A truly stunning specimen is our feature #BeakoftheWeek species today. I’d love to see one in the wild, but for now I’ll make do with museum specimens. Introducing the vulturine (its vulture-like bald head and neck lend it this name) or royal guineafowl. Along with the nicobar pigeon, these guys have some of my favourite plumage. Pure showmanship at its best. You can see a close up of them here to get a greater idea of how stunning they are. As luck would have it we have a bird plumage fan and expert all rolled into one in our Postdoc Thanh-Lan and here’s a great paper of hers about the function of barred plumage in birds. This article from the Cornell Lab of Ornithology just a nice job of briefly summarising the function of feathers and plumage. First described in 1854 by Hardwicke, the vulturine guinefowl is the largest species of extant guineafowl, measuring 60-72cm and weighing 1-1.5kg. Females don’t differ significantly in appearance from males although they are slightly smaller. They are endemic to eastern Africa and are generally found in dry open habitats especially Acacia and Commiphora scrub. They mostly forage on the floor in groups of about 20-30 birds (sometimes hundreds briefly together), scratching with their feet. Vulturine guineafowl feed on a variety of food including seeds, leaves, berries and fruit, roots and a variety of invertebrates. They prefer to forage near cover. If threatened they are much more likely to walk or run away than they are to fly, and if they are pressed hard enough they will only fly for 50-100m to escape danger. Fortunately they are good runners. Listed as of “least concern” on the IUCN redlist, it is predicted that there could be over 1,000,000 individuals in the wild. Thought to breed during or shortly after the rainy season, this species is monogamous, laying 4-8 eggs in a simple scrape in the ground. The eggs are incubated for between 23-32 days by the female and the precocial chicks leave the nest almost immediately after hatching. Both parents tend to the chicks and they are able to fly after 2 weeks. We haven’t featured a video of a chick hatching as of yet, and it is pretty fascinating to watch something hatch into the world so as a treat we have some links for you. Here’s a nice one of a chicken hatching (another precocial bird) and even better a link to a video of a Killdeer hatching too. Xeno Canto only has the one song from this species, but at least it has that, have a listen for yourself. BirdLife International 2012. Acryllium vulturinum. The IUCN Red List of Threatened Species. Version 2015.2. <www.iucnredlist.org>. Downloaded on 02 July 2015. Martínez, I., Kirwan, G.M. & Bonan, A. (2013). Vulturine Guineafowl (Acryllium vulturinum). In: del Hoyo, J., Elliott, A., Sargatal, J., Christie, D.A. & de Juana, E. (eds.) (2013). Handbook of the Birds of the World Alive. Lynx Edicions, Barcelona. (retrieved fromhttp://www.hbw.com/node/53529 on 6 July 2015). Turner, D. A. “Short communications: Comments concerning the type locality of the Vulturine Guineafowl Acrylliun vulturinum.” Scopus 31 (2014): 40-41. “Vulturine Guineafowl” by Gerald and Buff Corsi is licensed under CC BY-NC-SA 3.0. “Vulture like features” by Manfred Werner / Tsui is licensed under CC BY-NC-SA 3.0. Another classic #BeakoftheWeek! The exquisite helmet vanga with its iconic blue bill is the subject of this blog article. Endemic to the wonderful island nation of Madagascar, home to lemurs and aye-ayes, this species is vying for attention with its striking features. They missed a trick not having this guy in the movies. This species is highly distinctive with its huge hooked blue bill. It is ~30cm long and weights about 100g. It’s mostly black except for its rump, back and central tail feathers which are chestnut. Juveniles bills are pale brown. They are seen on their own or in mixed flocks with other vangas, cuckoo-shrikes and other passerines. They inhabit the evergreen humid lowland forests and forage 3-10m from the ground feeding on a variety of insects including cockroaches, butterflies, crickets and other invertebrates. Also known to feed on frogs and chameleons. Pairs are monogamous and lay clutches of 2-3 eggs sharing incubation, breeding and feeding duties. Chicks fledge after c.17 days. Here’s a great close up of one on a nest. Listed as of “Least Concern” on the IUCN Redlist, it is estimated that there are between 6000-15000 mature individuals, although this number is thought to be in decline. Once again you can go to Xeno Canto to see where they are found in Madagascar and listen to some calls. This is a nice short video of one perched on a tree. BirdLife International (2015) Species factsheet: Euryceros prevostii. Downloaded from http://www.birdlife.org on 07/07/2015. Yamagishi, S. & Nakamura, M. (2009). Helmet Vanga (Euryceros prevostii). In: del Hoyo, J., Elliott, A., Sargatal, J., Christie, D.A. & de Juana, E. (eds.) (2014). Handbook of the Birds of the World Alive. Lynx Edicions, Barcelona. (retrieved from http://www.hbw.com/node/60567 on 7 July 2015). “Helmet vanga” by Francesco Veronesi is licensed under CC BY-SA 2.0. “Helmet vanga on nest” by Eric Mathieu is licensed under CC BY-SA 3.0. One of our earlier stars of #BeakoftheWeek, the little penguin, is under the spotlight in todays blog. Also known as the little blue penguin or fairy penguin, the little penguin is the smallest member of the penguin family Spheniscidae and the only member of its genus. It is 40-45cm in length and weighs around 1kg, with males being larger than females on average and having slightly thicker beaks. Both sexes have metallic, slate-blue plumage on their upper parts and the majority of the head, and white plumage on their underparts. During its annual moult, the little penguin replaces all its feathers simultaneously and so must stay ashore for about 2 weeks as it is not waterproof during this time. Penguins are flightless birds and their ancestors’ wings evolved into flippers, making them powerful swimmers. Indeed the genus name of the little penguin, Eudyptula, means “good little diver”. The little penguin is a pursuit hunter, foraging for pelagic shoaling fish (in particular the Australian anchovy (Engraulis australis) and southern garfish (Hyporhamphus melanochir)) and cephalopods (e.g. red arrow squid (Nototodarus gouldi)) in the temperate coastal waters of New Zealand and Southern Australia. It can dive to depths of around 50 metres and normally feeds alone or in small groups. The birds return to their colonies after dark, often collecting in a raft with the same individuals out at sea, before coming to shore together. Breeding colonies can be found along the entire coastline of New Zealand and parts of Southern Australia, such as Victoria, Western Australia, Tasmania, New South Wales and South Australia. The social structure of the little penguin is monogamous during the breeding season and pairs often return to the same nesting site year after year, although the divorce rate is between 18 and 50%. The nesting burrow is excavated into sandy soil at the base of dunes or cliffs, under thick vegetation, in a natural hollow or even under human-built structures such as houses. The nest is lined with plant material. Across their range, little penguins have been recorded breeding throughout the year and have highly variable laying dates. Interestingly, a recently published study suggests that little penguins may be able to fine-tune their reproductive timing with marine productivity patterns (Afán et al. 2015). Two eggs is the normal clutch size and these are off-white in colour, sometimes with mottled brown markings or spots. Both parents incubate the eggs over a period of 33-37 days. Once they hatch, the chicks are in an altricial state and so need to be tended to and cared for by the adult birds. Chicks become downy, with dark brown down on their upperparts and paler brown and white down below. Young birds may form small crèches with other juveniles and reach independence at 50-55 days old. The average life expectancy of a breeding adult in the wild is approximately 6.5 years, however some particularly long-lived individuals have reached over 20 years in age, with the record being 25 years and 8 months (Dann et al. 2005). Little penguins have a variety of vocalisations, ranging from trills and braying sounds to low grunts and deep growls to loud squeals and wailing. A ‘bark’ contact call at sea is given. These penguins are particularly noisy after dark at their colonies, which can cause disturbance to residents that have little penguins nesting under their houses. However in many cases, the little penguins relationship with humans is positive. These charismatic birds draw a great deal of attention at specially organised tourist sites. For example, at the Oamaru Blue Penguin Colony and at the Penguin Parade on Philip Island, tourists can observe the penguins returning to their nests after dusk. Volunteers and staff also work to conserve the colonies and their habitat, educate visitors, conduct scientific research and monitor the little penguins. Sir David Attenborough does a great job at describing the penguins on Philip Island in this video. The little penguin is currently classified under the IUCN red list as ‘Least Concern’ primarily due to its wide range and large population size (unknown, but estimated to be over 1,000,000 individuals in the 1980s). Whilst the population is declining, it is not doing so at a high enough rate to warrant a change of classification to ‘Vulnerable’ at present. Many colonies are declining as a result of habitat degradation and predation by introduced animals such as domestic dogs, feral cats, stoats (Mustela erminea), ferrets (Mustela furo) and foxes (Vulpes vulpes). Fur seals (Arctocephalus forsteri) are a natural predator of the little penguin and are not thought to be a driving factor of population declines. Little penguins are also killed as a result of oil and plastic pollution, road collisions and entanglement in fishing nets. On the other hand, populations such as those in Wellington Harbour, Banks Peninsula and the Oamaru Blue Penguin Colony, are increasing as a result of predator control and the provision of safe nesting sites in the form of nest boxes. There are some good tips on how to help reduce the threats little penguins face on the New Zealand Department of Conservation’s website, including instructions for making your own penguin nest box! BirdLife International (2012) Eudyptula minor. The IUCN Red List of Threatened Species. Version 2015.2. <www.iucnredlist.org>. Downloaded on 01 July 2015. BirdLife International (2015) Species factsheet: Eudyptula minor. Downloaded from http://www.birdlife.org on 30/06/2015. Martínez, I., Christie, D.A., Jutglar, F. & Garcia, E.F.J. 2013. Little Penguin (Eudyptula minor). In: del Hoyo, J., Elliott, A., Sargatal, J., Christie, D.A. & de Juana, E. (eds.) (2013) Handbook of the Birds of the World Alive. Lynx Edicions, Barcelona. (retrieved from http://www.hbw.com/node/52468 on 29 June 2015). One of our favourite #BeakoftheWeek subjects so far was the King Vulture, the only member of the Sarcoramphus genus, and today it is under the spotlight. This species is the stuff of legends and was revered by the Mayans who thought that they acted as messengers between humans and the gods. It can be as tall as a Kune Kune pig (from 71-81cm) and its wingspan can reach lengths of 2 metres, which is roughly one Michael Jordan. The great basketball player may have believed he could fly, but he couldn’t reach heights of more than 500ft like these vultures. Imagine seeing this impressive species soaring above you and you can start to see why it was held with such high regard. They are found from southern Mexico to northern Argentina, usually in undisturbed forest, but also in grasslands and savana. King vultures are scavengers feeding on carrion which they typically locate by sight. They feed on carcasses ranging from dead fish to sloths and cattle. The majority of research suggests that this species does not have a functioning sense to smell to locate food and has to rely on Cathartes vultures (C. aura or C. melambrotus) in order to find food (Houston 1984), although other research found that they are more than capable to locating food on their own (Lemon 1991). King vultures have featherless head and necks, which is commonly associated with hygiene. Vultures often stick their head inside carcasses and if they had feathers in these areas pieces of meat and bacteria would collect there, potentially having adverse affects on their health. Research in griffon vultures has suggested that staying cool could be another reason for why vultures have bare skin in these areas . These guys are known for their strength. In a study comparing them to turkey, black and lesser yellow-headed vultures the king vulture was the only one capable of moving or turning a large carcass such as a calf (Houston 1988-link to paper). Considering they only weigh 3-3.75kg that is an impressive feat. It is perhaps unsurprising that they have few natural predators with snakes preying on young and opportunistic large cats getting adults whilst they are feeding. Only a few nests have been located in the wild, but there is good breeding information from captive populations. One egg is laid which has been reported to be incubated by the pair or just the female and hatches in around 55 days. Development in captivity suggests that they fledge at around 3 months. Here’s a charming video of a 25 day old chick being ‘fed’ by a rather odd looking adult. They are monogamous and the parents share brooding duties (Ferguson-Lees and Christie 2001). The king vulture is of least concern on the IUCN redlist although populations are in decline with some experts estimating that there are between 670 and 6700 mature individuals left in the wild. They are known to live for up to 30 years in captivity, although longevity and survivorship rates are not known in the wild. Check out this National Geographic video for a bit more info, although it does seem to have some differences with some of the information we’ve found! BirdLife International 2012. Sarcoramphus papa. The IUCN Red List of Threatened Species. Version 2015.2. <www.iucnredlist.org>. Downloaded on 29 June 2015. BirdLife International (2015) Species factsheet: Sarcoramphus papa. Downloaded from http://www.birdlife.org on 29/06/2015. Ferguson-Lees, J., and D. A. Christie. 2001. Raptors of the world. Houghton Mifflin Company, New York, New York. Houston, D. & Kirwan, G.M. (2013). King Vulture (Sarcoramphus papa). In: del Hoyo, J., Elliott, A., Sargatal, J., Christie, D.A. & de Juana, E. (eds.) (2013). Handbook of the Birds of the World Alive. Lynx Edicions, Barcelona. (retrieved from http://www.hbw.com/node/52944 on 29 June 2015). Houston, D.C. 1984. Does the King Vulture use a sense of smell to locate food? Ibis, 126: 67-69. Lemon, W.C. 1991. Foraging behavior of a guild of Neotropical vultures. Wilson Bulletin, 103: 698–702. “King Vulture” by Wayne Dumbleton is licensed under CC BY-NC-SA 2.0. “King Vulture soaring overhead” by Jerry Oldenettel is licensed under CC BY-NC-SA 2.0.